When traveling with young children we all try and reduce the amount we bring on holiday and it's well documented that the London Underground system is not always buggy-friendly. Firstly, buggies/pushchairs/strollers/prams (whatever you call them) are allowed on all of the London public transport network. What you will find though are steps or escalators and not lifts (elevators) at most tube stations. Things are improving but our tube system is old - the oldest in the world - so it all takes time to update. Elevators are being added at key stations but you shouldn't expect to find one everywhere; just consider it a nice surprise when you do. Strollers are allowed on the escalators (moving stairs) but you need to be confident holding your buggy balancing on one step. Heading upwards, some parents face forwards and hold their hands up high and others go on backward and lock their arms. You know the weight and size of your stroller and child so do what suits you best to be safe. I'd recommend traveling with another adult the first time you try this so they can be at the other end of the buggy while you gain your confidence. London buses are great when traveling with a stroller and there's an area for two strollers on each bus (when there isn't a wheelchair user already there; they have priority). It would be best to try and avoid rush hour times as commuters are less sympathetic when your family is taking up space on a crowded train and they're late for work. Transport for London produces a range of Accessibility Guides to help you plan your journey. Many families think they'll get around this problem by using a sling or baby carrier so their young child is strapped to them. This can work for some but it's tiring carrying your child all day, especially beyond a few months old. 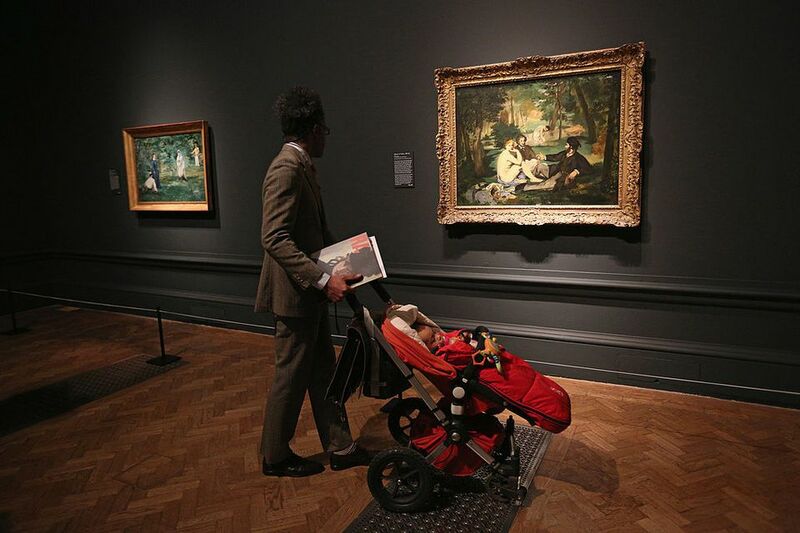 It's great to have the option but you shouldn't plan to only bring the baby carrier as you'll still be carrying the changing bag over your shoulder as well as all the other things you need for a day out in London, and anything else that you purchase. The carriers are not ideal when you need to sit down to eat and it would be nicer to have a buggy next to you so your child could be safe to sleep or rest while you have a hot drink. While you can transport your stroller on the plane, usually without affecting your luggage allowance, and you can often still use your own buggy right up to boarding, it can be good to consider a lightweight, foldable 'umbrella stroller' when traveling. Strollers get a lot of use - and come in some astronomical price ranges - so you may not want to risk anything happening to your usual one and instead consider a lightweight buggy for a city break. Toddlers and preschoolers still get tired, especially during long days out in London, so while your child may not need the buggy anymore at home they may still need a rest while you're out and about in London and having a buggy gives you a chance to let them do just that while you can still see the sights as most attractions are fully-accessible for pushchairs these days. There may also be times it would be good to have your child seated and strapped in so you know they are safe in a crowd, while waiting in line, paying in a shop, etc. or when your hands are full and you can't hold their hand too. A stroller that folds down quickly is great, and many have carry straps, making it easy to carry them when folded while walking down steps and holding your child's hand. If your child is asleep or not yet walking you'll discover just how nice Londoners are as no-one likes to see a parent looking stressed at the top or bottom of stairs and someone will come over and offer to help you. If you want to see if you can cope without a stroller in London first and then find you do need one there are plenty of places in central London to buy a cheap umbrella buggy. Recommended are John Lewis on Oxford Street (near Oxford Circus) and Mothercare on Oxford Street (near Marble Arch). You can also try Argos as they have lots of branches. A basic umbrella buggy should cost around £30/US $50 or less. Are Dogs Allowed on the Tube in London?